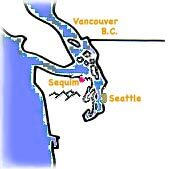 I am a chemist, physicist, and science historian living in Sequim Washington, USA. The logo depicts my small homemade boat, sailing (physics) in front of a periodic chart of the chemical elements. Sequim is located between the Olympic Mountains (background) and an arm of the Pacific Ocean known as the Strait of Juan de Fuca (foreground). I guess my passion has always been to understand our world. As this world gets more populated by humans and made smaller by better transportation and communication, our survival and future will increasingly depend on being one with our environment. If we understand the world and learn how to take care of it, it will in turn support what our being requires. I spent 40 years in classrooms at Sequim helping the understanding of local students. Now I proceed presuming there may be ways to help others elsewhere via the World Wide Web. While I use other computer platforms when necessary, Apple's Macintosh computers seems better suited (in fact a pleasure) for developing this web site. The apple and tag line think different are older logos of Apple Computer. But there is also a concept from physics embedded in the expression think different. The concept of entropy suggests that all change, including life, is due to entropy differences. It is the differences in the world which generate creativity. Efforts to conform and make everything the same stifle life and creativity, including science. So the phrase is given as a challenge to resist conformity, be creative, and try to improve the world we share. I recently realized that pleasure is what we learn it to be. The corollary is that if one's life isn't filled with pleasure, then one hasn't taught one's self very well. Many decades ago while attending a national conference, a young fellow college student told me that she thought that Christians are those who wherever they look, see Christ and rejoice in Him. The corollary to that is if you aren't finding your life filled with joy, perhaps you might want to try harder to see Christ everywhere. I should quickly add that I don't think one needs to be Christian to find joy in this life. A Buddhist, Moslem or ....atheist probably can find as much joy if they learn how, based on their faith. Although I was raised a Christian, I hesitate to judge others. I prefer to leave that to God. For those who choose not to believe in an entity called God, I add that I think of whatever is responsible for creating and maintaining our universe to be God. So science becomes a search for understanding God. As for myself, I hope I'm judged by You shall know them by their deeds. Finally to you, my dear reader: I offer this entire web site to you as a mechanism of free gratis, public education, for your enlightenment and joy. May you find pleasure and joy to fill you life to the brim.